Ghostbed is Casper's biggest competitor in the mattress market. We all recognize these two mattress brands due to the comfort, support and pressure relief they provide. Whereas Casper has been in the market for a longer duration, Ghostbed, a product of Nature’s Sleep, is looking to give Casper a run for their money by providing you with high-quality mattresses and pillows. Both mattresses have a lot to offer. They are high-quality mattresses that meet your needs. However, the above offerings by both mattresses are similar in nature but vary in various other ways such as quality, levels of comfort and support, firmness and responsiveness and adjustment to body contours. Edge support Right side support. The mattress does not bottom out when you sit at the brink of the bed. Poor edge support due to the use of memory foam. ver has a zip that allows you to remove it from the mattress. Right, its side of soft material that is easy to clean. It constitutes of 100% porous polyester material which makes it difficult to clean. It is relatively cheaper than the others in the market by about $100. A mattress may be one of the most important pieces of furniture in your home. Deciding which mattress to can be daunting especially with different companies competing viciously to perfect the craftsmanship of their mattresses. For this reason, I provide you with a comparison of these two giants that dominate the market. Top layer. It is the cooling and comfort layer. It is a 1.5' latex layer which enables temperature neutrality and bounce. The aerated latex layer provides support by offering you immediate responsiveness. Medium layer (support layer): This is composed of gel infused memory foam which gives you pressure relief and firm support. This layer is 2' and also aids in cooling. The bottom part (foundational layer): This 7.5' removable foam layer serves as the foundational support for the top two layers. On the other hand, Casper mattresses have a 9.5’ structure composed of four layers. Top layer. This layer is made of latex and provides you with cooling, comfort, and bounciness. Second layer. This layer offers support and pressure relief layer. This layer is made of 1.5’ memory foam and is below 1.5’ polyfoam layer which gives support. It allows for better heat dispersion compared to standard memory foam. Third layer. The polyfoam is transitional thus eases you into the tougher memory foam layer. This layer also adds to the mattresses responsiveness to body contouring. Bottom layer. 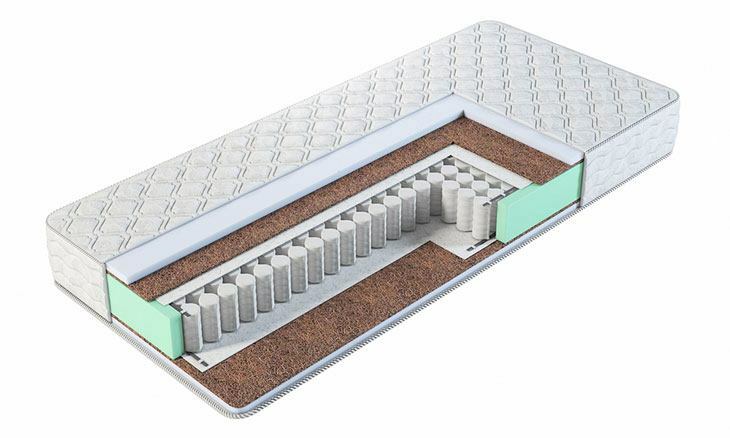 This 7' high-density foam layer functions as the foundation of the mattress. Comfort is the major aspect that you as the user will be looking for when you are purchasing a mattress. Both Casper and Ghostbed mattresses offer "universal support" to you, the user because they are both slightly more than moderately firm. They both have top layers made from latex foam that provides you with comfort and cooling. The latex also gives you added bounce and responsiveness. The memory foam which is significant in both the mattresses offers support and pressure relief. The Ghostbed and Casper mattresses provide medium firmness with Casper scoring 6 out 10 on the toughness scale while Ghostbed is a 6.5-7 out of 10. This stability may be due to thick supportive layers which are composed of a hybrid latex and memory foam system. The layers that give the foundational support for both mattresses are high-density foam. This layer contributes to the overall thickness of the mattresses, 9.5’ and 11’ for Casper and Ghostbed respectively. This system also provides the mattresses with superior support, body contouring support and medium firmness that serves your need for comfort. When it is hot at night, sleeping in a bed that provides moist and sticky conditions can be very uncomfortable. Luckily, both the Ghostbed and Casper mattresses have superior temperature neutrality qualities compared to many of their counterparts in the market. Their superior nature is due to their construction using composite latex layers. The latex layer (comfort layer), provides a cooling effect due to its convoluted aerated form. Cooling is also enhanced through the use of thin polyester mattress covers which provide breathability and heat dissipation. The gel infused memory foam in the Ghostbed mattress will give you more comfort, better body contouring, and cooling than the Casper mattress whose memory foam is not. The Ghostbed mattress cover provides you with a soft surface enhancing your comfort. The cover also has a zipper which allows you to remove the zipper for cleaning quickly. Whereas the Ghostbed mattress allows you to sleep comfortably in any position, Casper mattresses can be uncomfortable for side sleepers. As a side sleeper, I found that I often woke up with pain in my shoulder and back after using the Casper mattress. Using the Ghostbed mattress, I slept very comfortably. It provides you with excellent body contouring as it adjusts itself according to your weight. It thus gives you the necessary support to those who are heavier as well as a combined weight which is due to the 11' thickness of the mattress. This thickness is due to gel memory foam and latex layers that form it. The foam provides you with excellent contouring support allowing you to sleep in any position you want comfortably regardless of your weight. With the Casper mattress, people of varying weights have different experiences. It comes with a rating of 6 out of 10 on the firmness scale. For light sleepers like myself, I found that the mattress to be quite soft which is because my weight was supported by the 3’ layer of latex and foam. However, my husband who weighs 200lbs considered the mattress hard. All this is because his weight was carried by the thick supportive layers that beneath the soft latex and memory foam. For this reason, if you are a heavy sleeper, the vertical support of the Casper mattress may create pressure points. The Casper mattress, unlike the Ghostbed, does not, therefore, provide you with extensive support for the combined weight. These factors also contribute to Casper’s poor edge support. For Casper mattresses, cooling is also faster due to the porous polyester cover which spans the length of the mattress enhancing breathability. Also, the polyfoam layer is above the memory foam layer. This transitional layer reduces heat retention by the memory foam layer. On the other hand, Ghostbed mattresses provide temperature neutrality through its second layer made of gel infused memory foam and the aerated latex layer. The combined effectiveness of these layers gives you more efficient cooling. The second layer of 2 inches gel infused memory foam with a density of 4.0 PCF. This layer has slower responsiveness compared to the latex layer foam. Dimpled top cover constructed from 100% polyester with quilted sides and zipper for easy removal and cleaning. This cover is thin and stretchy thus providing a snug fit around the mattress. The first layer of 1.5 inches thick synthetic Dunlop latex foam with a density of 3.3 PCF. 100% polyester porous white top cover with gray sides. The cover is thin and stretchy and has a soft texture and runs from side to side. The density of the layers. The Ghost bed layers are of higher density than Casper which gives the user low compression support. The second layer of the ghost bed contains gel, unlike the Casper mattress whose second layer is plainly memory foam. The combination of aerated latex and the 2 inches of gel memory foam dissipates heat and improves airflow thus providing cooler sleep for the user. The Casper mattress top layer brink, on the other hand, is open-cell and uses convection and conduction to take away heat from the body. The thickness of the second layer of the two mattresses differs. The ghost bed is 2 inches while the Casper is 1.5 inches. The Casper mattress has four layers while the ghost bed has three layers. The third layer in the Casper mattress is made of polyfoam to enhance support for the user. The materials used for the covers of the two mattresses differ in texture. The Both Ghostbed and Casper consist of 100% polyester. However, the material of the removable cover of the Ghostbed is two-toned and dimpled. The side panels are a blend of quality fabrics which combine polyester and viscose for that comfortable feel and durability. The Casper mattress cover is 100% polyester making it quite porous and delicate. The total thickness of the Casper mattress is 9.5 inches while the Ghost bed has a total thickness of 11inches. You can check out this video to provide you with more answers on which one is better between Ghostbed and Casper. 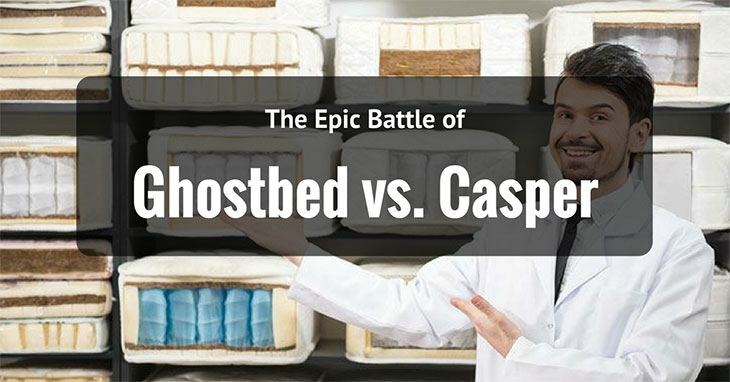 Ghostbed vs. Casper mattresses offer you a pleasant sleeping experience. They provide you with comfort through excellent body contouring, soft sleeping surface, and support. However, having slept on both Ghostbed and Casper mattresses, it is clear that Ghostbed will offer you more value for your money. Overall, Ghostbed mattresses provide you with a better sleeping experience compared to Casper Mattresses. Ghostbed mattress promises to give you a “supernatural” sleeping experience. They offer you more comfort, better support, feel and less motion transfer. Also, Ghostbed has better-combined weight support making it the best bed for couples and people who are heavier. You will also experience less sinking with Ghostbed which is attributable to its three-layer support system composed of gel memory foam and latex which form an 11'thick mattress. The perforated gel layers will also provide you with a better cooling effect compared to the Casper mattress. The best part is, Ghostbed mattresses will give you all the above perks at a lower price point than Casper mattresses. I hope that you now know which one to settle for quickly. Do you have any questions or want to share your thoughts with us? Feel free to write something in the comment section below.